← What Ever Became of John Bartleson? 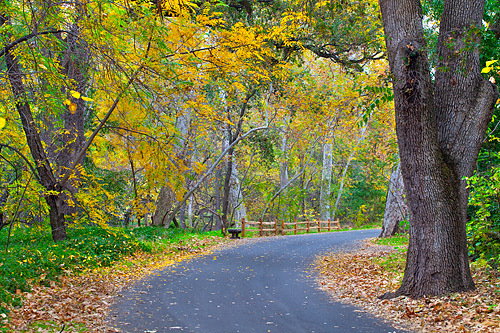 Have you ever wondered why we have a Vallombrosa Avenue in Chico? “Vallombrosa” is the name that John and Annie Bidwell gave to the strip of land running along either side of Big Chico Creek. It was a landscape that they loved and wanted to preserve in its natural state. Later, when Annie Bidwell donated the land to the City of Chico, it became Bidwell Park. But the Bidwells never called it that; they always called it Vallombrosa. High over-arched embower . . .
And where is that original Vallombrosa? It was a Benedictine monastery about 20 miles south of Florence in the Apennine Mountains. Milton traveled to Italy in 1638 and visited Florence in September. When he saw Vallombrosa he was struck by the beauty of the thickly falling leaves and later immortalized the locale in Paradise Lost. The name Vallombrosa derives from the Latin for “shady valley,” vallis umbrosa. This entry was posted in Vallombrosa and tagged Vallombrosa. Bookmark the permalink. Gee Nancy, What about the Mechoopda? What did they call it? Good question. Vallombrosa is what the Bidwells called the “shady valley” along Chico Creek when all the rest of the ranch was given over to wheat and cattle and orchards. The Mechoopda might not have had a name for that strip of land, but they probably did have a name for Chico Creek. I wonder who knows what it was? My cousin, who grew up in Chico, says that Chico Creek is a diversion from 5 mile which normally empties into the Rio Lindo Channel. I think it may be the other way around. Chico Creek was where it is now back when Bidwell first settled here. I think you’re right. And another correction, It’s “Lindo Channel”.